It is nothing but a flower which grows at the end of the stem that holds a bunch of bananas. It looks dark purple on the outside with layers of leaves or bracts wrapped tightly around each other that contain rows of thin, pale colored flowers inside. These pale flowers are used for cooking different kinds of dishes. Even though it is a tedious process to separate florets from a Banana Flower, the taste it gives in recipes is so good. We usually make Patoli or this pachadi with this. DH said it tasted exactly like Curry Leaves Pickle. Heat oil in a pan and add banana flower pieces. Pour little water and allow to cook until the pieces become soft and cooked. To this add cumin seeds + curry leaves + turmeric + red chilies and sauté well for some time. Finally add sambar powder and mix well. Turn off the flame and allow the mixture to cool. Then grind the mixture into a fine paste by adding tamarind pulp and salt. Add very little water, if needed. This chutney goes well with rice/chapathi. Perfect and love the taste of vazhaipoo. Didn't know we could make chutney out of this. Is the chutney bitter? Aww.. Awesome.. And totally new recipe to me!! 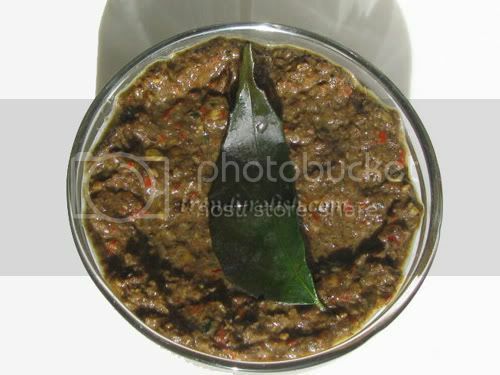 Vazhzaipoo chutney looks very delicious. Wow how innovative.I have seen banana flowers on banana trees but didnt know you can cook with them. 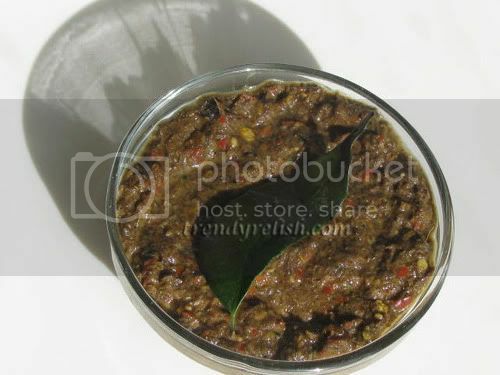 Very interesting chutney with banana flower....looks tasty Uma. Never had them, I like the taste of the banana flower. Would definitely try when I get them next time. This looks super!! What a lovely recipe. Very nice recipe Uma. Will try next time. This recipe is new to me. I pass the banana flowers in the grocery store because I don't like to remove the flowers and clean them. Maybe some day when I am having more patience I will make your recipe. This is new for me, love to try this recipe!! I didn't know a chutney could be made with banana flower. Thanks Uma!